Drawn and Quarterly, 9781770461260, 104pp. 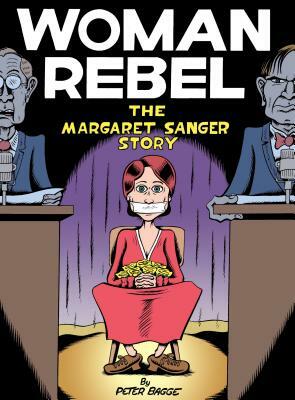 Peter Bagge's Woman Rebel: The Margaret Sanger Story is a dazzling and accessible biography of the social and political maverick, jam-packed with fact and fun. In his signature cartoony, rubbery style, Bagge presents the life of the birth-control activist, educator, nurse, mother, and protofeminist from her birth in the late nineteenth century to her death after the invention of the birth control pill. Balancing humor and respect, Bagge makes Sanger whole and human, showing how her flaws fueled her fiery activism just as much as her compassionate nature did. Sanger's life takes on a whole new vivacity as Bagge creates a fast-paced portrait of a trailblazer whose legacy as the founder of Planned Parenthood is still incredibly relevant, important, and inspiring.